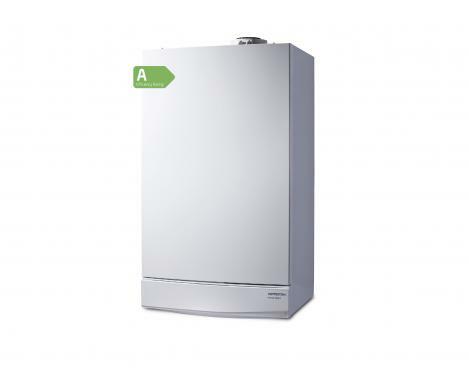 The Potterton Promax HE Plus 15kW boiler is designed for open vented central heating and hot water systems with a hot water storage cylinder. It has a SEDBUK efficiency rating of 89.40%. The main advantage of the Promax HE Plus is its size. Weighing in at 26kg it's very compact and measures 60x39x32. The 15kW model will more than meet any low heating requirements. But if you have high hot water and heating needs 24kW and 30kW options are also available. This compact boiler benefits from built in frost protection and straightforward simple to use heating controls in the shape of central heating temperature control and a reset switch. Easy to install it can be situated in an unvented kitchen cupboard cutting down installation costs and time. The Potterton Promax HE Plus is approved by the Energy Saving Trust for meeting the highest standards of efficiency.